A low emission development strategy is the foundation for climate-smart, transformative development. 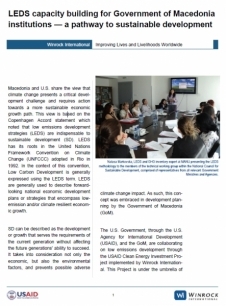 The USAID Clean Energy Investment (CEI) Project is working with Macedonian governments, businesses and others to prepare and implement LEDS. The project initiated a preliminary process of mapping national strategies with respect to LEDS, a significant step in the right direction which will serve as preparatory work and guidance for future undertakings of the Government of Macedonia with regards to sustainable-development planning.